Unified European currency continues to fall against American dollar this week. The decline of Euro is associated with the decision of European Central Bank to lower interest rate to 0.25% last Thursday. Inflation in EU continues to decline, while economic indicators do not change, so reducing interest rate ECB has planned to encourage economic growth. Some experts assumed that the purpose of this decision is artificial reduction of Euro rate to boost exports. However, the chairman of ECB Mario Draghi hastened to assure investors that Euro rate did not play a key role for this decision. However, Euro rate continues to decline. In the USA further fate of the quantitative easing program shall be determined in the near future, which will have additional pressure on Euro. Last week US GDP was above the forecast, which added confidence to the USD. This week attention shall be paid to GDP in EU and Germany, preliminary data will become known on Thursday. 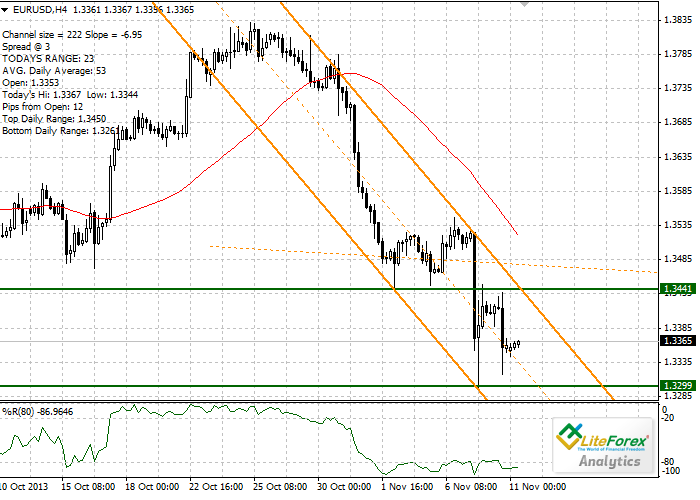 The nearest resistance level on the four-hour chart is 1.3441. Support level is 1.3299. It is recommended to open short positions after breakdown of the level of 1.3290 with the target of 1.3220 and stop-loss orders near 1.3330.